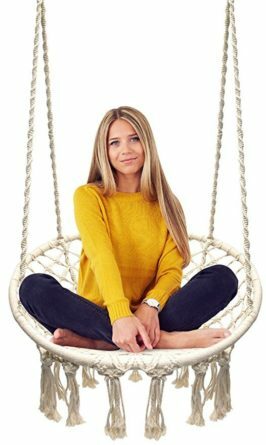 This handmade macramé chic swing chair makes a perfect place for your meditation, your reading or just day dreaming – Inside or Out! It is the perfect season for a portable hammock , which you can relocate almost anywhere!! GREAT for your bedroom too. This 100% handmade cotton rope and swing design features macrame net chair pattern with fringe tassels. You can even add colored beads and ribbons!! “I want to highlight it is reduced for a limited time from $99 to $72”, says Marlene.